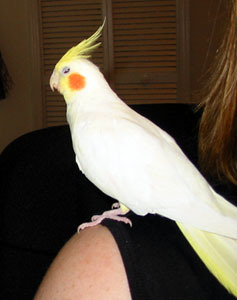 So, uh, on Sunday when I went down to my mom's house to bury Scuddy (there's nowhere I wanted to bury her around my apartment), she showed me the cockatiel that the neighbor had found in her yard a few weekends ago. The bird is very cute and very tame - she loves to have her neck scratched. I made the comment - "I want a bird just like you!" And, uh, now she's mine. Her name is NIBBLES, because she likes to do just that to your finger (and as I have learned, your toes). Her alternate names thus far are "Nibby," "Nibs," and "Nibblés" (pronounced NEE-blay). Niblay? What's that from? Your visit with teem? Aww, it's Nee-blay the Second! What a fabulous birdie. Although probably not as willing to be carried around in your purse and pose for bizarre pictures.